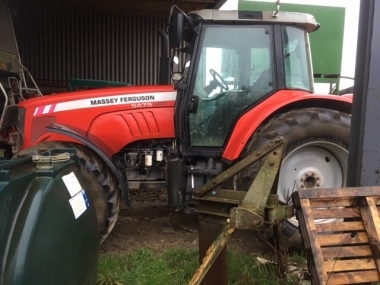 Massey Ferguson 5400 model range of tractors was launched in 2003, replacing the outgoing MF4300 series of tractors. Built at the Beauvais tractor factory in Northern France the MF5400 range of tractors included increased rear lift capacity, increased cab comfort with industry leading cab quietness, and modern power-control shuttle for clutchless forward and reverse using a multiplate wet clutch. There was still an option for a traditional mechanical dry plate clutch, but this was not commonly chosen by customers. 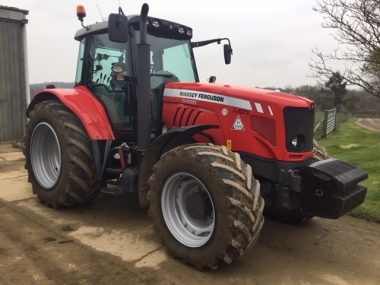 Electronic linkage control for the rear linkage was now standard fittment on the MF5400 range of tractors, providing industry leading levels of draft control from the renown Massey Ferguson electronic linkage control system. Transmission on the Massey Ferguson 5400 series of tractors was provided by the well proven Speed Shift transmission giving one clutchless change on the move (or 'splitter gear'). A four speed synchromesh gear change and two ranges (known as 'hare' and 'tortoise') gave 16/16 gears well spread across the field working range. Intially the MF5400 model range went from the MF5425 (at 75hp) up to the MF5465 (at 120hp). Options on the MF5400 range of tractors included either a 'steep nose' high visibility bonnet option (available on all the 4 cylinder models up to the 100hp MF5455), or the standard 'square nose' bonnet. For customers requiring a lower overall tractor height a 'low profile' version of the cab was produced reducing overall height to just 2.55m (in comparison to 2.77m on the standard version). 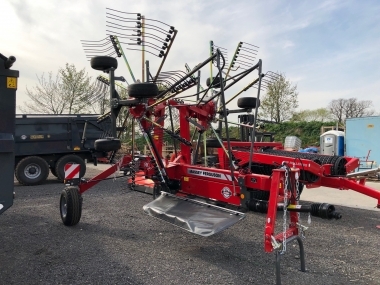 To make the MF5400 series tractors the Ultimate loader tractor, a special 'Visio roof' was also produced, which included a glass panel in the roof giving an excellent view of the loader bucket or pallet tines even at full height. Following the introduction of the Dyna-4 transmission with 4 full powershift changes on the move and a electronically controlled robotic 4 speed synchromesh gearbox, (still giving an excellent 16/16 forward and reverse gears) the MF5400 range gained powerboost (extra 10 hp), and new models : the MF5475 (6 cylinder 135hp) and the MF5470 and MF5480 (4 cylinder 125hp and 135hp respectively). Hydraulic options on the MF5400 range of tractors included as standard the Open Centre system giving 57 litres/min oil flow for spool valves (steering and other tractor functions including braking were taken care of by a separte low pressure hydraulic circuit). 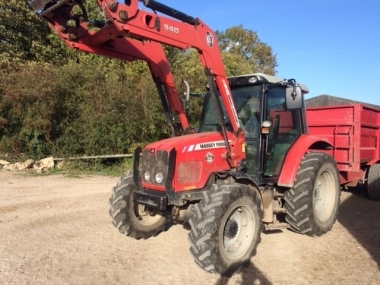 On the 4 cylinder MF5400 series tractors this could be upgraded to 100 litres/min oil flow with the selectable twin flow system (signified by a blue button in the cab), which was primarily fitted for use with a front end loader. On the 6 cylinder versions of the MF5400 series (MF5465, MF5475), a CCLS - closed centre load sensed hydraulic system could be specified (similar to the system fitted to the MF6400 range of tractors). With the move to Tier 3 engines in 2010, the MF5400 range increased in power across the board, with the best selling MF5455 now boasting 112 hp as standard and up to 125hp when boosted in Transport mode - (when in ranges 3 and 4 on the Dyna-4 transmission). Extra options became available with Quadlink front axle suspension (available on the MF5460 and upwards) and mechanical cab suspension (available on all models). 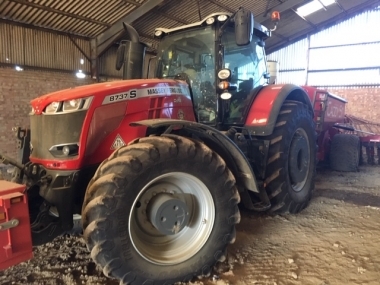 The most recent additions to the MF5400 range of tractors came in 2011 with the launch of the MF5440 and MF5450 tractors, that along with new and improved styling on the 'steep nose' tractors with one piece pivoting bonnet, provided optimised transmission and rear transaxle design to maximse on road performance. Other excellent features available on the MF5400 range of tractors included an option for a Dromone hydraulic extending high visibility rear pickup hitch (the MF5400 range came as standard with a high quality mechanical extending pickup hitch), and factory fittment of either/or integrated front linkage and Massey Ferguson (Quickie) front end loaders. 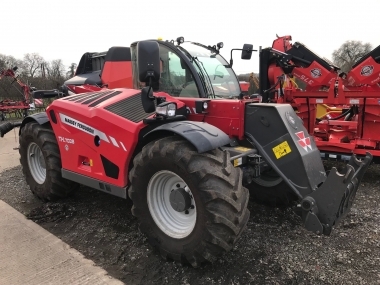 The MF5400 range of tractors were initially supplied with the MF800 range of front end loaders, which were superceeded by the MF900 range of front end loaders with improved visibility of the bucket and pallet tines, and internal hydraulic pipework. Standard features on the MF loaders included 3rd service, and on parallel lift versions, softride front end boom suspension. 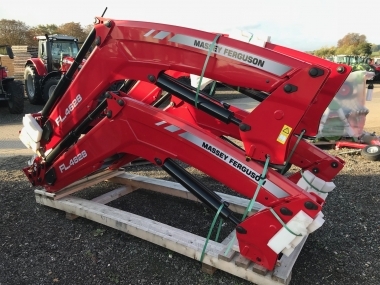 Typically the Euro 8 industry standard front end carriage was specified on the Massey Ferguson loader. buy every original 5400 - Range part online.